If you’re looking for a portable water heater, then it is time to consider the Camplux outdoor water heater. A revelation in the modern heating technologies, this tanker can be carried out anywhere without any restriction. The Camplux 5L AY132S model comes with minimum energy requirements as it relies on propane gas for heating up the water. This model is ideal for all those families who’re always on the go and often find themselves in such situations where it is difficult to find hot water. Another exciting feature about this model is the availability of lithium-ion batteries for ignition in case the electricity is not available. For any tankless water heater which is designed for outdoor use, portability is the key. When it allows you to travel with that unit at your will, you can get hot water anywhere you want. That is exactly the case with the tankless 5L Camplux heating appliance. When it comes with a convenient handle along with compact dimensions, it makes it very easy to set up this unit as the overall weight of this tankless water heater is just under 11 lbs. 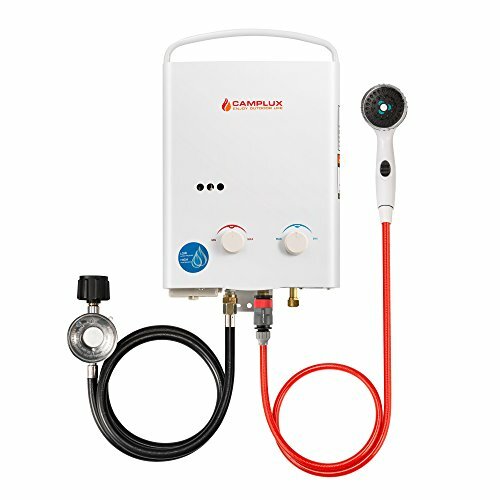 The 5L Camplux Propane Tankless Water Heater requires just 2 PSI for activation. This is one of the lowest activation requirements as compared to a vast majority of other tankless heaters so even if you’re in such a place where the inlet flow is extremely low, this unit can work just fine without any hindrance. As per the gas chamber, a minimum pressure of 0.4 PSI is required to operate the propane unit which comes with a power output of no less than 34,000 Btu/hr. Finally, you need a 12-volt water supply pump for operating this tankless heater. But if it isn’t available, which can be the case in case of an outdoor trip, this unit can also be operated with the help of 2D cell batteries. The Camplux outdoor water heater can provide 1.32 Gallons Per Minute which is on the relatively lower side. However, it does allow this unit to keep on providing hot water for a longer duration of time. Upon purchasing this appliance, customers will get a propane hose along with a gas regulator. The propane pipe is 5 ft long and both of these pieces of equipment are CSA approved which comes handy for the safety of the user. The Camplux AY132S is extremely easy to install. The manufacturer has provided all the necessary equipment for installation and all you’d need is a propane gas supply, water, and electricity. Even if the electricity isn’t available, you can still operate this unit with the help of 2D Cell batteries. 1: Mount the water heater to a faucet or attach it directly with the water. 2: Take out the gas cylinder and connect it with the propane gas pipe. 3: Connect the Propane Gas Pipe with the ignition chamber. 4: Take a shower hose and connect it the outlet chamber. 5: Attach water inlet to the water hose. 6: Attach the 2D Cell batteries and turn on the tankless water heater. 7: Start enjoying the hot water. The Camplux AY132S is great for camping, taking to the beach or on family vacations, use in mountain cabins or horse stables etc. With Oxygen Depletion Sensor protection, it can be also installed indoors where is well ventilated. Turn the ignition on with 2 “D” cell batteries whenever electricity is not needed! The ideal low water pressure operating range for the AY132 is 2.5～110.0 PSI for it to work easily with great performance. The system also works great on modified water systems with a 12 volt water pump. The operating propane gas pressure is 0.4PSI with maximum power output 34000btu/hour. The gas water heater can’t be used for drinking water. The tankless Camplux outdoor water heater line is not recommended for elevation above 2000 ft. The Camplux outdoor water heater comes as an extremely portable unit which can be carried out anywhere, everywhere. Weighing just under 11 lbs, its compact dimensions make it easy to carry even in your car’s back seat. In addition, it comes with the requirement of just 2 PSI for activation and this water heater can heat up 1.32 GPM. 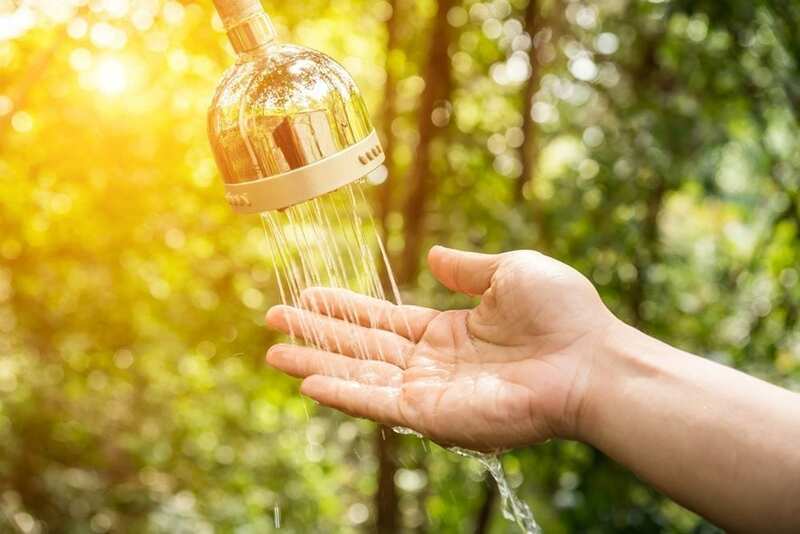 If you’re looking to make an outdoor trip in the near future, or even want something reliable to use in your own garden, this portable, and tankless unit comes at a pretty moderate price. A reliable unit with a decent flow rate, it can serve your hot water needs for a considerable duration of time.